Detection of the critical chloride threshold of carbon steel rebar in synthetic concrete pore solutions. Keywords: Carbon steel rebar, concrete pore solution, critical chloride threshold, potentiodynamic polarization, pitting potential. Knowledge of the critical chloride content in concrete required to initiate corrosion of reinforcing steel is economically beneficial for the assessment and maintenance of existing structures. Also, many building codes now specify a service life of 75 – 100 years for highway bridges and the critical chloride content is an essential input parameter in the models used in design of structures. 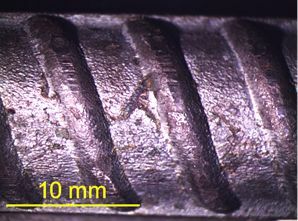 There have been numerous studies aimed at determining this parameter but there is no consensus because of the many factors influencing the corrosion. The current standard methods, e.g. ASTM G109, require many weeks or months of testing and are not appropriate for testing large numbers of specimens in different conditions. This project has demonstrated that a fairly rapid potentiodynamic polarization technique can be applied to carbon steel reinforcing bars in synthetic concrete pore solution to determine the critical value, as illustrated in the figure. The importance of selecting the appropriate synthetic concrete pore solution for this application is demonstrated by the different critical values obtained for different solutions. The success of this test will allow the influence of different reinforcing alloys and different cementitious material mixes on the critical chloride content to be determined in a reasonable period of time. Ogunsanya, I. and Hansson, C. (2019) “Detection of the critical chloride threshold of carbon steel rebar in synthetic concrete pore solutions.”, RILEM Technical Letters, 3, pp. 75-83. doi: 10.21809/rilemtechlett.2018.70.